When we feel that things are out of our control we tend to worry but how do you stop worrying? Most of the awful things we imagine will happen never do. We can be thankful for that. We should understand that worrying never helps a situation get better. Worrying sends a message to ourselves and those around us that we are helpless and have no where to turn. However, as a Christian, we believe that God has everything in His control. If He really does, and we really believe that, then we have nothing to worry about. We only need to trust that God will take care of everything according to His plan. Here are 7 tips from the Bible to help us stop worrying. These wonderful verses tell us to not be filled with care or worry, but to trust God in prayer. Stop worrying by taking your requests to Him. There is nothing wrong with having concern over matters and sharing that with God and with others so that you can pray. Often in prayer you will hear people asking God for peace in a situation. Why do we need peace? Because without the hope we have in God we would be filled with worry. Paul tells us in these verses we can trade our worry for peace through prayer. In the above verses to the Philippians, Paul says that another aspect of getting rid of worry is to be thankful. Be thankful for the things you have. Don’t dwell on those things you cannot control. Paul indicates that there is nothing wrong with taking your questions and concerns to God. But we should not go to Him out of anger and demand that He work everything out the way we want. We should humbly go to Him in prayer, with a thankful heart, and ask Him to give us that peace that will open our minds to understand and accept His plan. Just after Paul’s comments about worry he says that we should think on good, godly things. When we focus on positive and wholesome events, memories, plans, etc., then it is hard to be worried about everything else. In John 14 Jesus is explaining to the disciples where He is going and that He will return. In the meantime the Holy Spirit of God will come and indwell the believers. This was something new to the people of Jesus’ day. They did not have the Holy Spirit living within them like we do as believers today. One of the names of the Holy Spirit that Jesus often used was Comforter. As a comforter the Holy Spirit can help take your cares and ease them. That doesn’t mean we never have concern for things, but we don’t worry like we would if we didn’t trust that God was in charge. The Holy Spirit is our companion to remind us that God has control. Life was a lot less scary (and worrisome) when we were kids and we had parents who were bigger and stronger than us. When we had problems we could go to them and they would say that they would take care of it. We have a God that wants to do that for us today. Will you take your concerns to Him and rely on His strength? He is waiting to take that burden from you. Fear that we have is not from God. Understand that the basis of your worry ultimately comes back to the fact that you are not trusting God. God wants us to stop worrying and not to be afraid. God cares for you and me. He wants to take our problems and resolve them. Isn’t it frustrating for us as parents to see our children struggling with a problem, but they won’t listen to us on how to solve it? They come to us and tell us things are wrong, yet when we offer a solution they take the problem back and try to solve it on their own. It makes us hurt for their sakes. What are we doing to God when we worry? When we tell Him we want His help, but then we take the problem back and try to shoulder it ourselves? I have a friend that says she gets worried when she has nothing to worry about. I know she is joking when she says that, but the truth is we often do the same thing. Worry and anxiety becomes a habit. In some way it gives us comfort, yet it is not healthy and it shows a lack of faith. When you are tempted to worry or stress remind yourself that worry is a lack of faith in God. When you can trust that God has a perfect plan, then you will be able to stop worrying. Samson, David always blesses us with his articles. Thank you so much for visiting the website. If you like this one, click on David’s name to read more of his 65 marvelous works. He’s got such a great gift. Three fold AMEN… Lord U R So Worthy! I love U I love U I love ur name JESUS!! Most of all I TRUST YOU! Amen Wells, Jesus is most certainly worthy. Well said. I trust Him too. Thank you for such a beautiful comment. I’ve been wondering about something that is very disturbing and would thank you to reply about this…as you have recently and I am grateful. This topic is one of those that half the people believe one side and the other side believes the other side. My question is…can a christian lose their salvation? The main reason I ask is because I wandered from the Lord for several decades and I feel if one can lose it, it would be for that. Thank you very much again for your direction. Greetings again Ronnie. Instead of giving you a long answer here, please let me redirect you to an article that we have published over this very question. It is called “Can a Christian Lose Their Salvation? A Biblical Analysis” [the link is below]. I think it should calm your concerns and give you peace of mind. Let me know what you think after you read it Ronnie. Thanks again friend for visiting us. I pray for you now that God will give you peace and understanding in your situation. Thanks for the reminders and encouragement-my wife is terminal and medical bankruptcy may be on the horizon-if I didn’t think God was in charge, I couldn’t even get out of bed in the morning. Worry still creeps in, but when it does, I will repeat these reminders of God’s will. I know this is a very difficult time for you. It is encouraging to me to see your confidence in the Lord. As I was posting my comment earlier today, I was praying that God would end my wife’s suffering. At 2:00 p.m., I got a call from the nursing home that she had passed away. I am so thankful that a merciful God is in charge of the universe. Hello dave. Blessings to everyone here who stumbled upon this website looking for God’s grace and an answer. I wanna ask for your prayers for recently i have realized that i worry way too much, and been going through anxiety these days due to my physical health (GERD) Through my experience with GERD and Alot of Anxiety i know God is trying to pull me closer and just have me rely on him for everything i need in life. I pray that whoever reads this that they can pray so god can really heal me fully, and that God really puts comfort into my heart, and my mind. I want to stop worrying, and seek refuge in christ’s arms and I dont want my thoughts to wander. Thank you David. This article gave me peace while I read it and I hope it will carry over throughout the days and nights. Unfortunately I constantly worry but it has brought me closer to the Lord everyday(His plan), however my grief and worry can get no worse. I want to let my worry and grief go as I do trust in the Lord, but why can I let go of this worry & anxiety? It is slowing destroying me. Please help & pray for me. Thank you. Thanks. This made a big difference in my day. Thank you for this wonderful article. I have been spending most of my life worrying, and up until I read your article, I was worried about a presentation I am about to do. Thank you God for always bringing good things my way. This article gave me more peace 🙂 If you have time, please pray that I will be able to trust God to find my science fair notebook. This sounds so trivial compared to bigger matters but please pray for me nonetheless. Thank you! I loved this article. It will help me get through the day. “Ask God for peace in a situation so you don’t have to worry. The hope we have in God we wouldn’t be filled with worry. ” “Don’t dwell on the things you can’t control.” Amen. This article is helping me put things in perspective. With the financial worries my daughters college tuition payments, paying bills, and trying to stay ahead it is very unsettling with worry. My husband and I work so hard to provide for our family but its always an extra bill, taxes etc….I love you Jesus and you have always been their for me and my family. Please Lord, I am giving up my worry to you and asking you to give me peace of mind and enjoy my day to day life. I love you and I ask you for joy and contentment and to walk beside me and comfort me. Hi. Thank you for sharing this beautiful Words of God. If I may this question: is it wrong to pray to God for financial blessings, even if the purpose of which is not very important such as vacation money? God bless. I don’t think it is wrong to pray for anything as long as you pray with a willing heart to accept God’s answer. What you are praying for may be wrong, but that doesn’t mean you can’t take it to the Lord. He may answer with a No, or He may not answer at all. But there is nothing wrong with taking it to the Lord in prayer. And, yes, I am even talking about praying for things that you know can’t be the will of God. You pray honestly before the Lord and allow Him to change your heart. I am not saying that you praying for vacation money is wrong. I think it is a perfectly good thing to pray for. I am making the statement that it is OK to pray for anything that is a burden to your heart. I’ve been having anxiety about my insomnia, depression, and finishing my last two classes in college. I know God is a healer and he knows what’s best. I broke up with my boyfriend of 8 years and it hurts. I thought he was going to marry me. I feel shame that I didn’t do it sooner. He apologized this year in an email and It just hurt me more. I’m asking The Lord to help me let go of him. It’s been around 10 months and slowly recovering from my nervous breakdown. Trying to pray more and increase my faith. It’s very hard and battling depression is a struggle everyday. God wants the best and I will keep moving forward. I’m really scared that I can’t sleep without a sleeping pill. B/c it’s not natural. I’ve tried and I just stay up all night. Going to work the next day tired. Not sure how I’m going to focus in school. Trying to stay positive. Erica, thank you for sharing your thoughts and concerns here. I pray for you right now that God will give you clear direction on how to proceed. Let me encourage you to find someone with whom you can freely talk about your anxiety and insomnia. It does not need to be a professional counselor (though that would not be bad). I think you might be very surprised as to how talking with someone who will commit to pray for you will make a big difference. Find an older lady in your church that you respect and build a relationship with her. It doesn’t matter that much if this is someone you know well or not. If you are away from your normal church family while you are at school, you can find someone in the church you are visiting. Try to find someone who will listen and pray. It doesn’t have to be someone who has all the answers in life. In fact, it is probably best if it is someone who will listen without offering much advice at all. Anxiety is one of the things that is often helped by the process of sharing your concerns with someone. Especially someone who will pray and will remind you that she is praying for you. There is great emotional strength that comes from knowing someone is praying for you. I would also look to diet and exercise as ways to help your insomnia. When I say diet, I don’t necessarily mean eating only salads. I mean that you should consider that some things you eat and drink can be a source of some of your insomnia. I think strenuous exercise is good for everyone, but honestly it doesn’t require running 5 miles a day to get the emotional and physical benefits that exercise can bring. Try to commit to walking 30 minutes to an hour a day for 4-6 days a week. That may be enough to help clear your mind from much of the stress you currently feel. I trust God will show Himself strong to you during this time. Great article. I find this website in general is helping me get my fingerprints on the Bible and use it as it was intended, Life’s ultimate instruction manual. I love that I can come to your site and find articles that direct me to the verses of what I’m questioning. These worry passages are amazing and I feel a huge weight is already being lifted off my shoulders! This has article has indeed blessed me and i am now a changed person with the new outlook on how things like. It’s early morning was looking for prayer on worry an found your article I will keep reading it. I am going through such a rough time an I know worry is a sin yes I struggle with anxiety an panic attacks an phobia of meds. I wonder why this has come upon me. I have to keep trusting God. They have raised my meds to 400 a month. I know my Heavenly Father knows an cares. Have to start trusting an believeing. Thank you God Bless. Hello David Peach, I have a question for you. How do you know that “God want us to stop worry and not be afraid”, when the word worry wasn’t even mention in 2 Timothy 1:7. Hello Eugene. I cannot speak for the author of this fine article but 2 Tim 1: 7 says “for God gave us a spirit not of fear but of power” and I see fear as a form of worry and if we are fearful then we are worried about something, right? Fear is a worry about something so the lack of fear can be extinguished by the power of the Holy Spirit because God has given each believer the Holy Spirit and not given “us a spirit of fear.” Does that make sense sir? I hope it does and thank you for your comment. Just making sure that I am reading this right. Are you saying that the spirit of fear include things like worry, anxiety etc? Since god didn’t give us have the the spirit of fear, therefore we can conclude that “God wants us to stop worrying and not to be afraid”. Are my right? Yes, you are spot on Eugene. Thank you so much sir for understanding. God doesn’t give us a spirit or tendency to fear but one of power because if God is for us, who can be against us (Rom 8:31)? Ok sounds great. By the way, I’m just wondering, did you see and read all of my comments? Or do you only see the comments when I reply to your comments? If you’ve noticed every time I post a comment I make a mistake, and to fix that mistake I have to reply to my own comment and mention the fact that I made a mistake in that comment. So did you see those comments where I mention the fact that I made a mistake in my previous comment? So if you only see the comments when I reply to your comment then that could be a problem. This is probably the most naïve question you have ever seen but I just want to make sure that we understood each other. I made a mistake in my first comment I meant to say “god want us to stop worrying”, of course if you read it fast you wouldn’t notice the difference. I want to stop worrying and trust Gid, but I find it difficult with all I see around me.. I see believers losing their children due to tragedies, accidents, and diseases while their prayers go unanswered… How can I stop worrying about my children if God does not promise to keep them safe and healthy, if He lets all these things happen to children of believers, how can I not worry about my kids? I want to stop worrying and trust Gid, but I find it difficult with all I see around me.. I see believers losing their children due to tragedies, accidents, and diseases while their prayers go unanswered… How can I stop worrying about my children if God does not promise to keep them safe and healthy, if He lets all these things happen to children of believers, how can I not worry about my kids?? I have a friend who is in turmoil with her worrying. She gets dark thoughts in her head that she is so ashamed and disgusted with that she believes that she needs to be or will be punished by God. Her worst fears are that she will never be forgiven and will go to hell or that something will happen to the people closest to her to punish her and it will all be her fault. The turmoil is worst when these thoughts come when she is doing anything holy i.e. at church, praying or reading the Bible. I have been trying to give her reassurance that these thoughts do not come from her heart, because I know she is a kind God loving woman, and therefore are not her own thoughts. I tell her that it is the devil who is putting these thoughts into her head because he does not want her getting closer to God. I also tell her that God does not punish those who love him and ask forgiveness for their sins and would never harm anyone else because of our own shortcomings. She prays to God to help her and is frustrated that He doesn’t seem to be doing anything. I tell her that God is the answer and that what you need to have is complete faith and trust in him that there will be no consequences due to the dark thoughts because He knows what is in your heart and mind. I try to give her hope that it is good that you do find these dark thoughts disgusting and wrong because this is the real you at work. She was at church a few months ago were the reading and sermon was based on Luke Chapter 12. In verse 10 it states that “And everyone who speaks a word against the Son of Man will be forgiven, but anyone who blasphemes against the Holy Spirit will not be forgiven.” She is convinced that her dark thoughts are doing this and therefore she will not be forgiven. I keep trying to explain to her that this is not something that can be done by thought alone. It works for a while but the fear never truly goes away and so continues to come back as a worry nearly every time she gets into a dark place. I do not know what to do other than to keep reassuring her, trying to convince her to trust God more and to pray for her. If you have any other suggestions I would appreciate them. I find the part of your article about fear interesting. As a Christian myself, I find the subject confusing. On the one hand we are told that “God hath not given us the spirit of fear”, yet there are many versus that warn us to be fearful of God. In fact you could sum our whole Christian belief into 2 camps, Hope and Fear. Hope that if we declare our love for the Lord and confess our sins that He will save us and we will live with him forever. However, if we do not, we should be fearful the consequences of going to hell. I know a lot of sermons are based on this reasoning. I would be interested in your views on this. Peter, thank you so much sir for your question about your friends fear. I noticed that she fears more when she is doing something for the Lord. That tells me that this may be the enemy getting into her head. Our worst spiritual attacks come when we are doing things for God and for His glory. Anyone who has repented and put their trust in Christ has no reason to fear. The word “fear” when talking about God usually means a holy, reverential respect and deep admiration for God…not a fear of being struck down and sent to hell. that is the enemy putting that into her mind. Our hope in God is not a hope-so but a know-so and so please try to reassure her that anyone who is born again has no more fear of the wrath of God. Please ask her to read John chapter 6 and 10. Fear is the opposite of trust and she must not reply on human feelings because they are highly unreliable but God’s Word is always true. The more she stays in the Word, the less I believe she will fear. Has she spoken to her pastor about this? I suggest she does. She is convinced about her dark thoughts but the human heart is deceitful and untrustworthy…God’s Word is as sure as the sunrise…in fact, more son. I have changed from an addictive sinful past. Although it has not been long I have turned to God and given him my sins and worries. I have always been a believer but never a listener. I have started reading the Bible and plan to finish. I look to scripture for guidance and today like many my past has haunted me and I still pay for having an addiction. My daughter pays for it most and I look to God to help me right my wrongs I’ve done by being absent and choosing drugs. I have changed completely but I still worry that change is not enough although I have won my battle with drugs I have not won my battle with worry. God put it on my heart to read this today and its exactly what I needed to hear. 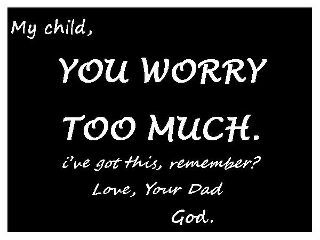 I give God all my worries and know as long as he is in my heart and my actions that there is nothing to worry about. God has my back and loves me no matter what I have done but loves me more for who I have become. Thanks for the scriptures I needed them today! I hope you can help me to find the answered all my worries and problems when it comes to my financial problem. I am a civil engineer, and working in one company here in the philippines, but I am also a bread winner who used to help financially my entire family. I have always a problem everytime i received my salary because it always short and thinking that its not enough to sustain the needs of my family and even myself. That is why am asking God to help me to be out of here, and wanted to work in abroad. Do you think I still have a chance to work abroad? So true. May God bless you all, and help us all to trust Him to be constantly with us amid the uncertainties of tomorrow, with all the power of creation behind Him. Lord i need your peace. please help me to stop worrying and start believing that you will make everything okay. Hello Mr. Fitzpatrick. Please know that for everyone who’s repented and trusted in Christ cannot be taken from Christ’s or the Father’s hand (John 10:28-29) and if we confess our sin, God is faithful to cleanse us from ALL unrighteousness (1 John 1:9), lying included. Trust God. There is no sin that the blood of the Lamb cannot cleanse. Read 2 Cor 5:21 to see why I say that sir. Means Tge world to me tonight as I can’t sleep and was consumed with anxiety. I hope the lord uses me one day line he has used you to encourage others to keep their eyes where they should be! Currently I am having trouble trusting God with my situation and I don’t know why. This guy I’ve been seeing for about 6 months is starting to ignore me and put his friends before me. I’m in love with him and don’t want to lose him, I literally will do anything to keep him. I want to know HOW do I let go and give this to God? I just want the same love back that I show him. I’ve been falling into depression again and having suicidal thoughts (not just because of this guy). There’s so much pain and chaos in my life right now that I feel like maybe that’s the reason he’s acting like this. I would really appreciate it if someone replied back and let me know where I can start to let go and let God. Thank you. Hello Shay. It is better to know ahead of time if someone is really serious about you than if you got married and then would be stuck with a spouse that didn’t really love you. See this as a benefit because love must be a two-way street or it won’t work. I would call your pastor too and tell him what you’ve told me. Pray together and ask your church to pray for an “unspoken need” in unloading all this on God. I would also seek professional help. Tell your doctor. Suicidal thoughts are a danger sign. Please seek help, the prayers of the saints in your church, and your pastor or a trusted Christian friend. Thank you so much for this article, it gives me so much comfort an is a reminder that we must allow the Most High Yah to handle the things we cannot as human beings. When we hand over our worried to our Father we must leave them with him an not take them back. That hurts his feelings when we do that because it shows that our worry is overriding our faith in the one who has created us an lives us. I have to truly discipline myself concerning this issue an stop allowing worry to creep in an take over. No need to worry. Yah has it, just like he had it last time an the time before that an the time before that. We also hurt ourselves when we worry when in the end the Most High always shows us that we worried for nothing. He always works it out. ALWAYS….PEACE AN BLESSINGS TO YOU ALL. I have had a difficult life. I am bipolar and have PTSD. But God made a REALLY strong girl when he made me. I have been able to deal with the PTSD diagnosis by the grace of God. Every day I ask God to fill my head with his words and thoughts to replace all the negative thoughts that remain in my heart and head from 60 years of abuse. It is working. Next – I’m tackling the worrying issue. Do you think having mental disorders, of which anxiety and sleep problems are huge issues, play a part in my inability to just let God take over my burdens? I feel my faith is very strong and growing more each day yet I still worry. I’m going to read the article tonight and pray for peace. Please pray for me. God bless. I really needed this right now. I cannot thank you and God enough for this. Thank you and right on time Josh!! Just had a very confusing talk with my supervisor, she is a bully and talks down to me and one other really nice man. I know she is struggling in her personal life, however, she takes it out on me and others. I did worry tonight because she threatened to escalate the topic to our manager. I’ve done nothing wrong and yet the threat bothered me. After reading your article I feel so much better and remember that worrying is an insult to God. I asked Him for his peace, prayed for her and thanked Him for his promise of peace. So thank you for this article and God bless. Hi Eugene my brother. Yes, I did see them and no problem. I make mistakes and typos and I usually let them stay because I want people to know that like I tell the church where I pastor at in my sermons: “Today, part of me sermon will be absolutely perfect! The part where I read out of the Bible.” LOL I see all comments and even the ones with mistakes but that’s okay. I can only cast stones at myself brother. This is a very good question and not naïve at all my friend. I loved it and it shows me the humility with which you have and as part of the fruits of the Holy Spirit.